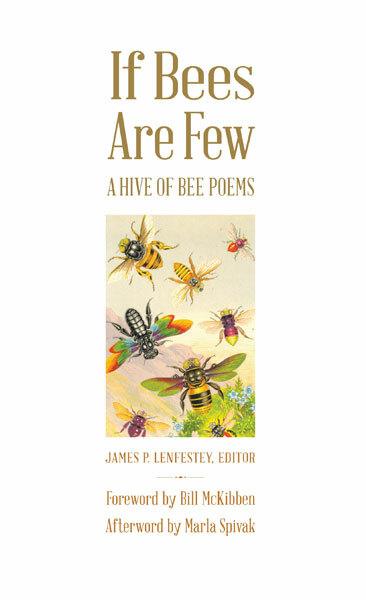 UMP | University of Minnesota Press Blog: Let's hear it for the bee. Let's hear it for the bee. It is said there are twenty thousand species of bees in the world, a genus fifty million years old, but in the fertile imagination of the world's poets, there is no beginning and no end to bee buzz. As Rilke wrote, poets are "bees of the invisible. We wildly collect the honey of the visible, to store it in the great golden hive of the invisible." Sappho wrote of bees in the sixth century BCE ("neither honey nor bees for me"), as did Virgil, Rumi, Shakespeare, Bobby Burns, Clare, Coleridge, Robert Devereux, second Earl of Essex, Emerson, Herrick, Issa, Machado, Mandelstam, Neruda, Dickinson prolifically, Whitman, Whittier, Tennyson, Yeats, Frost, and on into the distracting buzz of the twentieth and twenty-first centuries, from Sherman Alexie to Timothy Young. Sylvia Plath's father kept bees, and while living in England she tried it, too. She got six jars of honey and the famous "bee sequence" of poems from 1962, later published in Ariel, which convinced her she was a real poet. During the early seventies, when I ran an experiment in rural education, I kept bees. This fact relates me to Plath, but encounters with bees, whether in the guise of a bee-masked holy father or the mysterious swarms themselves, were indeed unforgettable to us both and worthy of praise in poems, if one can only figure out how. To make a prairie it takes a clover and one bee. Ross Conrad writes in Natural Beekeeping: "The bee is the only creature in the animal kingdom, that I am aware of, that does not kill or injure any other being as it goes through its regular life cycle. Apis mellifera damages not so much as a leaf. In fact, honey bees take what they need in such a way that the world around them is improved." During much of human history, bees and human life have been intertwined, lured by more than durable sweetness. As early as 3000 BCE, one of Pharaoh's titles was "Bee King," and beekeeping had begun at least by the seventh century BCE. Hilda Ransome notes in The Sacred Bee in Ancient Times and Folklore that one cathedral of the Middle Ages required thirty-four thousand beeswax candles annually for services planned during one year. Rudolf Steiner, in a 1923 lecture on bees, goes so far as to say, "If you look at a swarm of bees, it is, to be sure, visible, but it really looks like the soul of a human being, a soul that is forced to leave its body. . . . You can really see, by looking at the escaping swarm of bees, an image of the human soul flying away from the body." From sweet honey to practical wax to spiritual projection, the bees have been able to handle it all. Until now. The age of synthetic fertilizers and monoculture farming creates bee food deserts, certain pesticides scramble their nervous systems, and pests such as the mite Varroa destructor sap their strength, all of which weaken or collapse honeybee colonies and wipte out wild bee species. That's our age. That's right now. Poets do what we can, in our reverie, our observation, our listening, our metaphors, our occasional beekeeping, our outrage, our grief, to keep the sweetness and sting of these poetic companions alive. Scientists and citizens must do the rest. This book is dedicated to entomologist Marla Spivak, whose pioneering work with bees has awarded her a MacArthur fellowship. A portion of proceeds from this anthology are dedicated to the Bee Lab at the University of Minnesota, established by Dr. Spivak. James P. Lenfestey is a former editorial writer for the Minneapolis Star Tribune. He has published a collection of personal essays, five collections of poems, the poetry anthology Low Down and Coming On: A Feast of Delicious and Dangerous Poems about Pigs, and coedited Robert Bly in This World, also from Minnesota. His memoir with prose and poems, Seeking the Cave: A Pilgrimage to Cold Mountain, Milkweed Editions, was a finalist for the 2014 Minnesota Book Award.